Last edited by Kauz on Tue Aug 16, 2016 3:54 pm, edited 14 times in total. Be sure to also send a list of your own. I've got the Impaled nazarene - Satanic masowhpre EP for sale. Its the one where the first batch has a misprint on the label, which had 'Profanatica' on the flipside instead of IN. So, make your bids. And to all of you cheap assholes, don't bother bidding. Looking for the following cds (only original press-cds are of interest). My list is attached at the bottom of this message. I'm looking for old BM zines written in either Swedish or English. Preferably within the time frame of 1992-1998.
we'll see if we can work something out. 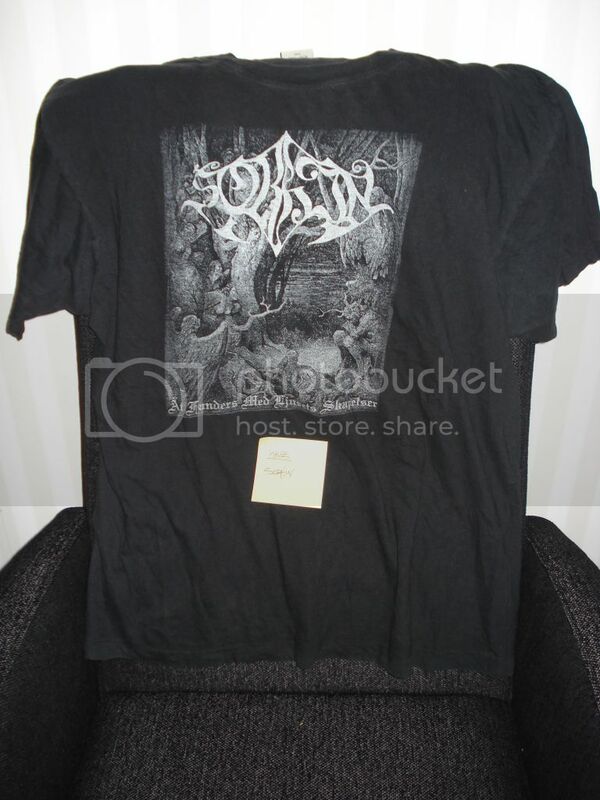 I've got an old AXEGRINDER t-shirt up for trade/sale. A really rare piece of gold, in the size M/L I would guess. The size tag is cut away though. If the picture quality is too poor just let me know. If you find any interesting titles, send me a PM along with a list of your own tradelist. Acheron - Necromanteion communion PIC-EP 1998 Merciless records (M.R.EP008). (Limited to 1000 copies). Benediction - Transcend the rubicon CD 1993 Nuclear blast records. Brujeria - Matando gueros CD 1993 Roadrunner records. Brujeria - Raza odiada CD 1995 Roadrunner records. Cradle of filth - Vempire MCD 1996 Cacophonous records. Cultus - Promo 2007 DEMO 2007 Heidens hart. Fleshcrawl - Soulskinner CD 2002 Metal blade records. 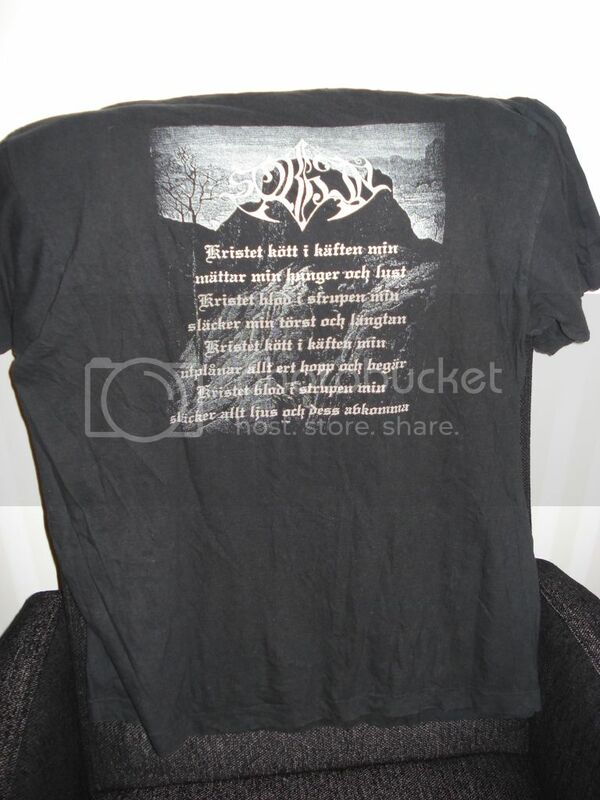 Looking for all kind of black metal shirts. Size S.
If you got NÅSTROND - "Toteslaut" please let me know. Feel free to offer balanced trades or fair prices. Selling these two really rare gems of the old french black metal scene. You make the bids. Don't ask for price. Any questions? Don't hasitate, just ask. Looking for NÅSTROND releases. Let me know if you have any up for trade. So if you have it, send a PM. Pro-printed cassette limited to 300 copies. In great condition. along with a tradelist, and we'll see if we can work something out. Azazel - The night of Satanachia MCD 1995 Miscarriage / Holocaust records. (Limited to 400 copies). Last edited by Kauz on Tue Sep 11, 2012 7:32 am, edited 1 time in total. I'm looking for Sadistic intent albums. If you've got any of em up for trade, send me a PM. Send your lists in a PM if interested. 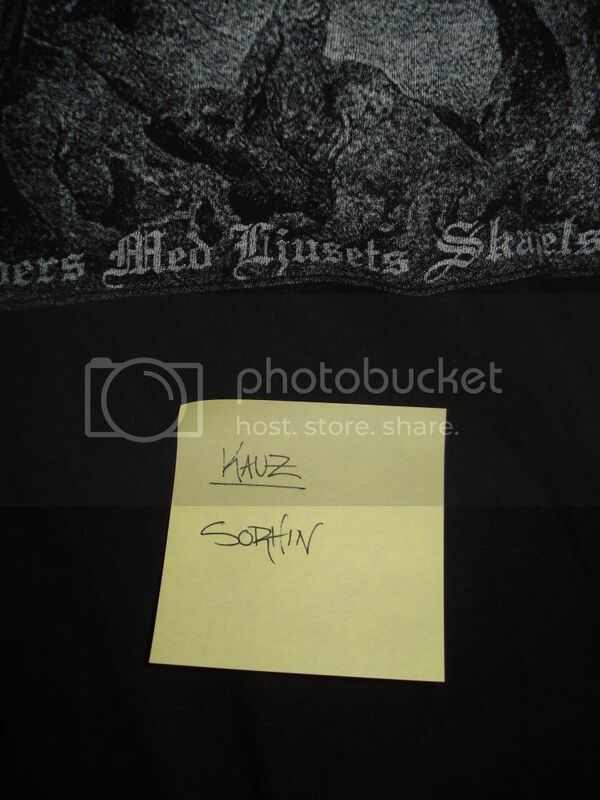 I've got the ultra rare Sorhin shirt "Åt fanders med ljusets skapelser" for trade. shirt for sale or trade since the late 90's. interested in buying it, YOU give me an offer. Do NOT ask for price. Hey man, do you have a photo of it at all? There was a bootleg re-print on eBay recently if you've just bought that...? Sure. I can take a picture of it and post in the thread. I was just too lazy at the moment I wrote the thread. And no, this is not bought at e-bay. This is bought right here in Sweden, and looks just like the one I owned back in the 90's. The color of the shirt is a bit faded aswell, which shows that its used and not a recently printed bootleg shirt. But sure, let me get my digital camera and upload some pictures of it. I'll be back. This shirt was originally bought at the old swedish store Heathendoom back in the late 90's. A store located close to Rådmansgatan, Stockholm where Tena's Shadow Rex later had his store headquarter. At the moment I have no written wantlist. So if you got a tradelist just send it in a PM.